Tim Tebow could be on the roster for the New York Mets at some point in 2019. The Mets' recently hired general manager, Brodie Van Wagenen, said it's a possibility he'll play at Citi Field, though he likely will start the season in Triple-A, according to MLB Network. 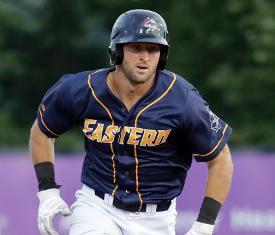 Tebow, the former NFL quarterback-turned-network college football analyst/baseball player, played for the Mets' Double-A team, the Binghamton Rumble Ponies, last season. In 84 games, he hit .273 with six home runs and 14 doubles. He struck out 103 times in 298 plate appearances. Former Mets general manager Sandy Alderson signed Tebow, now 31, in 2016. He told ESPN in February that he thought the outfielder had big-league talent. "I think he will play in the Major Leagues," Alderson said then. "That's my guess. That's my hope, and to some extent now after a year and a half, a modest expectation."